The Australasian New Car Assessment Program – ANCAP – is continuing to penalise car makers that do not equip their models with the latest autonomous emergency braking technology (or AEB), this time making an example of South Korean brand Kia. AEB works to reduce the severity of front-on crashes by taking over braking duties from the driver if certain parameters - like closing speeds between cars - are breached. Simple AEB systems rely on cameras to measure distances, while more sophisticated systems use a combination of cameras, radars and laser radars (called lidars) to improve the quality of the information fed back to the car. This in turn allows the car to more easily identify smaller, slower-moving obstacles like pedestrians and cyclists, and usually from higher speeds than single camera-based systems. To highlight the importance the local vehicle safety assessor places on high-level pedestrian protection technology, ANCAP has taken the unusual step of awarding the 2019 Kia Cerato a split rating. The Cerato, which competes against other small sedans like the Mazda 3, Toyota Corolla and Hyundai Elantra, was crash-tested at ANCAP’s Sydney headquarters, where its front and rear occupant structures passed with flying colours. The more premium Sport Plus and GT Cerato variants are fitted with the highest level of AEB, which includes both pedestrian and cyclist protection, earning them the full five-star rating. However, the camera-only AEB system that comes standard on the more affordable Cerato S (above) and Sport reduces the rating to four stars. Kia Motors Australia media and corporate communications general manager Kevin Hepworth explained that he expected many S and Sport customers to option their more affordable Ceratos with a $1000 Safety Pack, which adds the more advanced AEB for the full five-star rating. The option also bolts on rear cross traffic and lane keep assistance as well as the higher-end AEB, which uses radar technology as well as a camera for a more detailed view of hazards in the road ahead. Instead of including the option as standard fare, Hepworth said price was crucial at the entry point of the segment, and a majority of customers would prefer to make the decision whether to add the option themselves. “$1000 at base purchase is a fair degree – that’s five to eight percent of the car,” he said. “The customer makes their own mind up on it … It’s all relative in the market”. 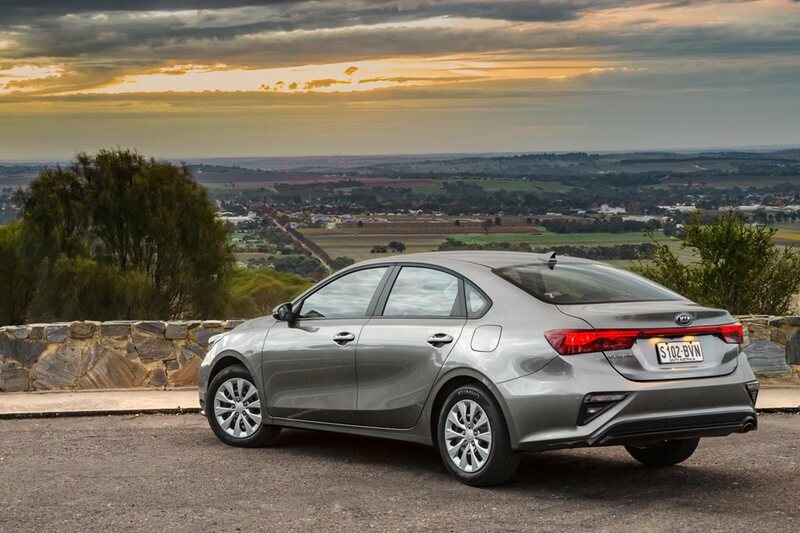 The base Cerato S kicks off from $19,990 before on-road costs, and a sub-$20,000 price ticket is a powerful marketing tool in the fearsomely competitive small hatchback and sedan market. ANCAP chief executive James Goodwin said the latest Cerato scored well in both adult and child occupant protection, but better protection for other road users would have earned the full five stars for all variants. “The Cerato performed well in its protection of adult and child occupants, scoring 90 percent and 83 percent respectively,” he said. “All variants offer autonomous emergency braking and lane support functionality; however, the AEB system fitted to S and Sport variants offers reduced performance.